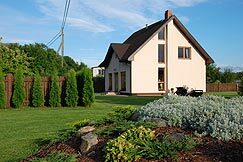 Guest House, Holiday House - " Riekstnieki"
Holiday house „RIEKSTNIEKI” is a calm and cozy place in Plienciems, where to stay and spend great holidays together with your family and friends, relax after intense working week or just stay overnight. New, large, modern facilitated house just 200 m from the sea. In the house there are 4 bedrooms – on the second floor three bedromms of four there are 2 single beds, what can be easily transformed in to a double bed. Besides it is possible to use to seated sofa for sleeping places in the lobby of second floor. In the first floor bedroom there is a double bed. The bedroom is connected with a bathroom, where there is a massage bath for two persons. On the first floor there is also a wide living room with TV and home cinema sound system, and a fireplace. Near the living room there is a kitchen with all necessary household commodities. All house is equiped with heating floor, what will make your stay comfortable even in cold wheather. Beside the house there is a sauna-house. In the sauna there are four-seated three sweating shelves. Sauna is heated with wood. All walls and ceiling in the sauna-house are finished with lime-tree wood siding. You will have nice relaxion there, as there is also a hall with a table and sofas for relaxing. It is possible to use the hall as a living room with its small kitchen and two-seated sofa.